Yesterday I unpacked some of my boxes of precious books which are stored in my sister’s garage. There’s something tremendously reassuring about caressing the blue cover of my Oxford English Dictionary, and running my fingers over the dog-eared pages of my mother’s bright red copy of Chambers Thesaurus. A feeling of home. It’s been three months since I packed them, and in the interim I have resorted to using Google in their place. But for all its speed, the internet doesn’t have the cosy feel of my own special books. I’ve given them a place on the bookshelf next to my bed, so they are within easy reach when I need help. Next to them are the rest of my reference books on writing, and on the shelf above are other favourite books about writing, together with my tatty collection of personal writing notebooks. Below these two shelves are the travel guides, plus maps, and all my own travel diaries from places I have visited over the years. They have provided valuable information when I’ve written about faraway places. The initial impression captured in those travel diaries, regardless of how much detail about setting may be absent, is always the key to the essence of a place. While the actual memories may not always be within easy recall, a quick re-read puts me back into the same frame of mind I was in when I first wrote them. Albums of photos help me later by recalling a visual reference, but it is the notebooks that contain the seeds of the setting. 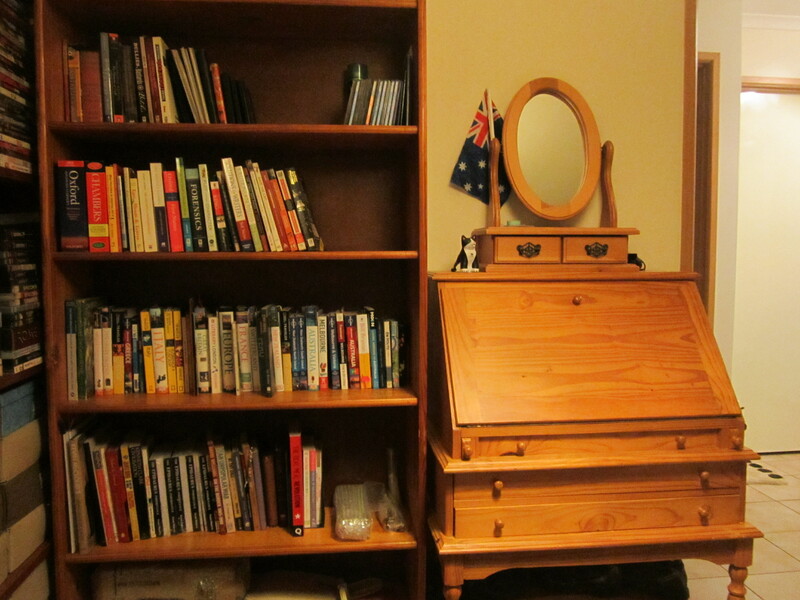 Next to the bookcase is my little writing desk, the home of all things to do with stationery: pens, pencils, fresh notebooks, stapler, sticky-tape, paperclips and rubber bands. I have loads of envelopes too, in various colours, but since all my correspondence nowadays is via email, the envelopes are more for ornamentation than for practicality. Talking of practicality, I write only notes and journal entries at this desk. It’s too small to accommodate the laptop, several notebooks, my favourite large teacup and all the other paraphernalia that surrounds me when I write my novels – a dining table is more the size I need for those – but it is a very cute desk and reminds me of the larger one my parents had, on which I often did my homework way back in the 1970s when everything was painstakingly written in cursive. 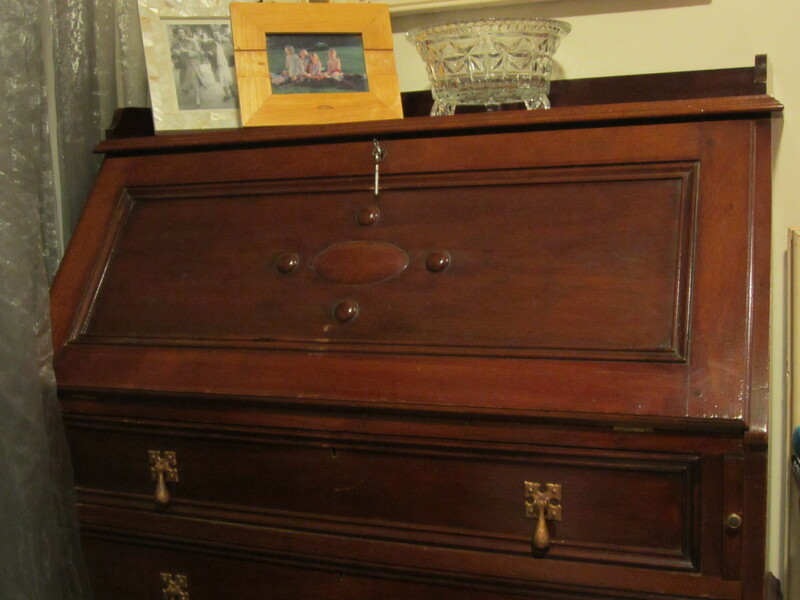 My mother had the desk restored to its former glory about twenty years ago and today it stands proudly in my sister’s study, which is the room next to my bedroom. It’s strange but comforting to have come halfway around the world to be reunited with the trappings of my youth, and with some of its dreams. Which brings me to my next novel. I don’t know where the next will be set, but it will be in a place I have visited, written notes about, and dreamed of. First, however, I must complete my current WIP which is long overdue. The best day for starting on any writing project is always today, and I will do that just as soon as I’ve finished writing this blog-post. The surest way to recover from upheaval in one’s life is to pick up the tenuous threads and start again, in front of a desk, one word at a time. This entry was posted in Susan Roberts and tagged writing desk. I must say, on reading the headline – as it appeared in my email – my first thought was: Sue, you and I have had this discussion about your clothing … That said, I am pleased to see you creating what will (hopefully) be a space conducive to the creative writing. I certainly look forward to getting word of your next missive. Er… you still haven’t read the last one yet!